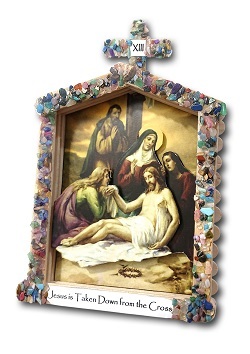 Each kit contains everything your family will need to create their very own COMPLETE set of three-dimensional Stations of the Cross grottos, including semi-precious gemstones, pre-cut wooden sticks, and full color art work. Each completed station measures 5" wide by 7" high. This kit is recommended for children age 10 and up... OR... for children 6 and up with close parental supervision and guidance. What a great way to focus your family's thoughts during Holy Week! "Each year our family had taped up pictures of the Stations of the Cross during Lent so that the children could do an abreviated version of the Stations. What a great learning and art lesson it was to actually make beautiful stations to use around the house. This would make a great family project during Lent - teaching the Stations as you go, or a great project before Lent. If the Stations are completed by Lent they make a beutiful addition to Lent by placing them around the house so the children can be introduced in the Domestic Church to the beauty of this prayer." "Thank you for creating and distributing this wonderful kit. I have three of my five children who are able to do it with minimal intervention from me (the mom). After telling them that we shouldn't waste and mix the gem stones, my children began sorting out each color and they were offering up the task for various souls according to the color of the gemstones! Many souls were saved last night, or at least prayed for and we haven't even begun to hang up our stations and pray them yet!!! God bless the products and the people at Illuminated Ink. " "I purchased this lovely kit with the intentions of making it our family project during the Lenton season. As our six children and I worked on each station, my husband lead us in prayer and meditation. Our children throughly enjoyed the project. It was an fun way to live our faith with our family. And now we have a beautiful display of the Stations of the Cross on our wall that our family and friends can use for years to come. Thank you for creating such an inspirational and "easy to use" craft kit! "